This group tends to be a little low on traffic, but I figured I'd post anyway. Saturday is my first Olympic triathlon. I've done two others this season - one a super-sprint, the other slightly longer than a sprint. Both were very successful, and I exceeded my expectations. Since then, training has gone well despite taking nearly a 3 week break while I was in Kenya in June. I feel like I'm in the best shape of my life, and my comfort level on the bike has greatly increased. I was a competitive swimmer as a kid, so picking that up again has been even easier than riding a bicycle, and at the triathlon in June, I had the fastest swim split in my age group. However, Saturday is forecast to be one of the hottest days of the year. The Olympic distance race doesn't start until 8 am, so probably at the earliest, I'd start running at 10 am. I have tried to acclimate by doing some mid-day runs, but it hasn't been THAT hot and most of my routes are partially shaded. Currently, it's forecast to be 87 degrees at 10 am and 90 by 11 am. Any tips? I'm amazed at those that swam competitive at an early age can pick it back up so easily. Guess it's early form training that's etched into the memory. I would be prepared to adjust expectations accordingly. Not sure what support/aid will be at the aid stations on the run but if it's going to be that toasty, do what you can to keep yourself cool. Keep up with the fluids (water and gatorade, you'll need the electrolytes). Make sure you hydrate well on the bike. Many events will have ice available. If you wear a hat on the run, put ice under your hat, or put some pieces in your tri suit. It's all about trying to manage your core temp. I don't know how much you sweat but I've found S-Caps to be helpful for heavy sweaters. I've bombed out in a couple of hot marathons. At Boston this year, it got a little toasty on the course and I used salt tabs in a race for the first time. I think it helped but it's something I knew going in that I needed to address. The Olympic distance intrigues me. I'm hoping to hop in one next year. Good luck and have fun! Splash some cold water on your head at the aid station and wear one of the cooling towels around your neck during the run. At 90 degrees you probably shouldn't need too much more hydration unless you really push it. Try to stick with the nutrition plan you've been training with. If you make too much of a change on race day, it may not go so well. Good luck on your race! I've done only 1 olympic distance triathlon. It was the hardest race I've done in terms of effort and pain BECAUSE I didn't adjust my expectations. It was hot and humid, and I had expected to run a 10k in my 10k goal time. But the heat was unbearable, and it forced me to slow down. I was red-lining my race for the first 5k, and it sucked every bit of my energy during the last 5k. I finished 5 or 10 minutes slower in the 5k than I wanted to finish. The water support was less than perfect (4 oz cups filled 1/2 full.... I needed 8 of their cups per mile! Demand > Supply). Since then, I went to longer distances at slower speeds. It is much more enjoyable . With the longer distances, I learned a lot that would help me today with shorter distances. Freeze a couple of water bottles tonight and bring them to the race. In Transition 2, make sure you take those water bottles with you and run with them. Don't assume that the race directors have the proper water for you on a hot race day. Your core body temperature can be controlled through ice. Wear a hat to protect you from the sun. The HeadSweat visors are perfect as you can wear them upside down and you can put ice in your visor to keep you cool. You'll do fine, but don't be too disappointed if your run goal time is not attained. Your run will be whatever you have left for the run. Focus on the quality you have with the swim and the bike and you'll be fine for the run. Enjoy!!! Thanks y'all! I'm a little bummed since I've put so much into training, but everyone else out there will be facing the same conditions. I've read up a bit more on the race since then. It's a half-mile between the swim finish and the transition area, so they've cut off a half mile from the run. That's a little weird, but the total distance will still be the same. It also means they recommend taking your running shoes down to the swim finish. The upside is that I'll only have to run 5.7 miles on the back end! The e-mail said they would have ice towels at the run turn-around, which will help, but I'll also probably take my handheld water bottle for the run. mbehr, one of my earliest swim coach was a former Olympian who was a stickler for technique, and all of that drill work and focus definitely served me well when I picked it back up again. I've truly been amazed at the muscle memory since it had been about 15 years since I'd swum! Long-term tentative plan is to work towards a 70.3 next year. In February (or whenever it was), I made my Declare It Day goal with Fellow Flowers: that I would train for and complete an Olympic-distance triathlon by Labor Day. This was the race I had in mind. After two shorter races already this summer, I hit the training hard. As I mentioned, my original goals were to go sub-3 hours and run a sub-60 10K. When the weather forecast emerged, those goals changed to "finishing without ending up in the medical tent." I did not go sub-3:00, nor did I run a sub-60 10K, but I did finish without requiring medical assistance. The swim was 1/2 mile away from the transition area, so H and I walked over there. The course mostly consisted of a loop around the marina the briefly went into the Cumberland River, the same river that goes through downtown Nashville. I got in the water to warm up and found it a) warm and b) quite easy to swim in. All of the sprint-distance people went first, and then it was our turn. I was maybe 32nd or so in the water and promptly passed a bunch of people. I would find some room, then come up on other racers, and pass them. My goal was to stay calm, which I screwed up when I swam head-first into a giant branch and screamed. The part that went out into the river also had a bit of a sideways current. Finally, I passed the final buoy and turned towards the boat ramp and ran out. Tentative goal was sub-30, and I swam 29:48. T1: Then I had to put on my shoes and run a half mile, which was more difficult than it sounded. Two fast guys passed me in the transition, not surprisingly. Once I got to the transition area, I got everything together quickly and grabbed my bike. Then we had to run up a grassy hill while pushing our bikes in cycling shoes. I hadn't practiced that part. I was happy to finally get on the bike. The bike is a huge mental game for me. It took me about 5 miles to feel comfortable, and there was some pretty long (but not super-steep) climbs in that time. My legs did not feel good for a while. I told myself that all I had to do was ride 12-point-something miles to the turnaround. Breaking it up mentally felt better, and I started to hit my groove even as a lot of the people I passed in the swim caught up to me. The course kind of sucked. We were mostly on the shoulder of a two-lane highway with cars zooming by us. Not scenic in the least. After the turnaround, I had the pleasant realization that the "back" part was significantly more downhill. No wonder my legs didn't feel great. I ate my Huma gel and drank the Skratch in my water bottle. Except then I dropped the water bottle. With 10+ miles to go, I was going to need that fluid, so I stopped, hopped off my bike, and went back to get it. So graceful, this one! The rest of the ride was thankfully uneventful. My tentative goal was around 1:30, and I finished the bike leg in 1:30:01. T2: Very fast, ran back down the hill with the bike. Changed out bike shoes for running shoes, slammed my visor on my head, and off I went. Oh hi, the run was freaking hot, like I knew it would be, except worse. We mostly ran along the bike lane and one blocked lane of a very busy road with cars churning out exhaust and heat as the sun beat down on us. I told myself to make it a mile. Then I told myself to get to the first aid station. After the first aid station, I switched to a 4:1 run/walk, which worked since I hadn't taken my run alerts off of since the last time H and I ran together. This totally saved me, along with cold towels and ice in my sports bra (something I haven't done since Flying Pig!). I figured I'd get passed by a bunch of people, but only like 3 people passed me because we were all locked in a death march. The occasional cloud offered some respite. Once I got to mile 5, I knew I'd make it, so I took one last walk break and tried to kick it in. Woohoo finish line! They had cold water and misting tents and lots of medical personnel around. One guy was being tended to and ended up getting a bag of IV fluid. My official time was 3:06:14, but it took a while for the results to go up. Since I'd completed fewer than 3 triathlons, I registered in the Beginner category, which I automatically won as I was the only female. But more to my liking, my time was also good enough for 2nd overall in my age group. I won a nice insulated cooler bag and was very happy! Excellent job! Excellent race report! It's crazy how the run feels when it's hot, isn't it?! It sounds like it was the type of race where you know you want to do it again and see whether you can tweak stuff slightly. There's another 6+ minutes there where a little extra experience (and better weather) may help you . Congratulations, and thank you for sharing your race with us. 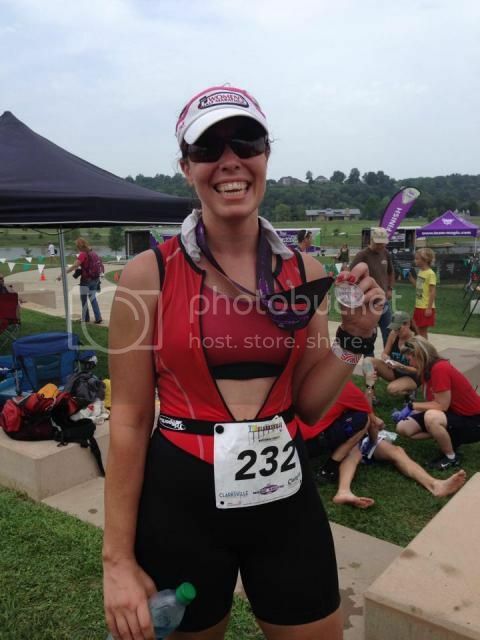 kmays- congratulations on your finish and thanks for sharing your epic race report. An AG podium spot to boot!